Are There Probiotics in Chocolate? If you are like me and enjoy probiotics and chocolate, then probiotics IN chocolate would be a dream come true. Whether or not they are present in it, however, depends on how it came to be. Chocolate comes from the cacao bean from the cacao tree, Theobroma cacao, which grows within 20 degrees north and south of the equator. The cacao tree bears large, oval fruits or pods with seeds, or beans, inside. The pods turn a vibrant orange-yellow color when mature. These pods are split open to expose the beans and pulp. Typically, the cacao beans and pulp are fermented under banana leaves and stirred for varying lengths of time to reduce the bitterness and astringency of the beans. The beans may be cut into small pieces, or nibs. Sometimes the beans are removed from the pulp and washed without fermentation. Next, the beans are dried, many times under heat. At this point the beans are typically referred to as "cocoa". To make chocolate products, the cocoa beans are roasted, the shells are separated from the "meat" of the bean, and then the nibs are ground and combined with added ingredients. These added ingredients and the type of processing determine if the final product has any health benefits, including probiotics. Cacao/cocoa in general has fiber, minerals and polyphenols, special plant compounds, in it. The polyphenols in cocoa beans contribute to about 12-18 percent of the dry weight of the whole bean. In fact, cacao/cocoa has the highest concentration of polyphenol flavanols, such as catechin and epicatechin, among commonly consumed foods. Additionally, cacao/cocoa is a rich source of magnesium and has mood-enhancing properties. It is no surprise that cacao, in particular, has shown benefits in conditions such as insulin resistance, heart disease, high blood pressure and cholesterol oxidation via its antioxidant, anti-inflammatory and anti-atherogenic activities. Chocolate Must Be Beneficial Then? In moderation, research shows that some types of cacao/cocoa may be beneficial to you whether or not there are probiotics in it. in healthy volunteers compared the effects of a high-cocoa flavanol (HCF) drink versus a low-flavanol (LCF) drink on the effects on their gut microbiomes and some biochemical and physiologic markers. Both drinks contained 9-10 grams of sugar per drink and were matched for calories, fat, protein and other markers. After 4 weeks, total cholesterol in both treatments was significantly decreased. The HCF group had a significantly increased Bifidobacterium and Lactobacillus populations and significantly decreased clostridia counts compared to the LCF group. The HCF group also had significant C-reactive protein (a marker of inflammation) and triglyceride reductions. There is also research to support cocoa polyphenols in benefitting Type 2 diabetes. In vitro results with monomeric catechin-rich cocoa flavanol and rat pancreatic beta cells and islets showed that the cells cultured with the flavanol had better glucose-stimulated insulin secretion compared to cells cultured with total cocoa extract and other polyphenol fractions. Thus, this specific cocoa flavanol may help improve beta-cell function to improve the quality of life of people with Type 2 diabetes. There are many other studies suggesting beneficial effects in cognitive function, obesity development, gut mucosal integrity, inflammatory bowel disease, immune function and others. The HCF group in the first mentioned study consumed 494 mg of cocoa flavanols while the LCF group consumed 29. It would be wonderful if I could tell you exactly which products at your local store would mimic the 494 mg of flavanols, but according to an article on the Consumer Labs website, most chocolate bars and cocoa/cacao products do not label the flavanol content and buying organic or high-percentage dark chocolate are not guarantees. Some products they tested were highly contaminated with cadmium or lead, two toxic heavy metals. Even a PubMed study on 12 brands showed that a higher-percentage dark did not always mean more flavanols, mostly due to losses during processing. 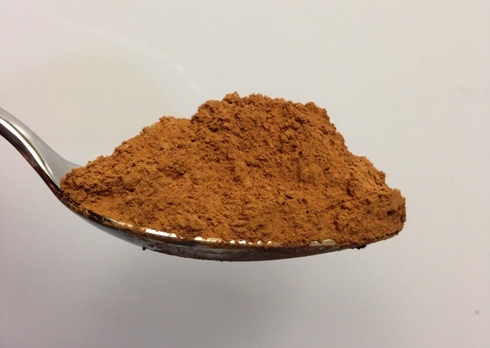 One popular organic cacao powder only has 17 mg of flavanols per 2.5 Tbsp. In general, though, dark chocolate is better for you than the milk variety not only in terms of flavanol content but sugar content as well, and unless flavanol content is listed on the label, darker usually means more flavanols. Also, “Dutch” cocoa, while less acidic and more pleasant to taste, is processed with alkali and usually has reduced flavanols. As much as 90% of the flavanols can be lost during processing, so the less processed the cacao/cocoa, the more beneficial for health. What about white chocolate? Skip it if you are looking for high antioxidants, prebiotics or probiotics. It is a combination mostly of cocoa butter (a fat from the cocoa bean), milk solids and fat, sugar, vanilla and lecithin. Are There Probiotics in Cacao/Cocoa? Cacao/cocoa's fiber and flavanols act as prebiotics to feed helpful gut bacteria. If cacao is wildly fermented with native microbes and/or intentionally fermented with specific microbes, there are microbes that grow on the substrate. As with many fermentations, there is a succession of microbes with time, so that as one type of microorganism dominates and is then self-inhibited, another type of microorganism thrives in the new conditions. The types of microbes found on the cacao vary depending on the fermentation length and conditions, so there is no guarantee that certain microbes will be on all cacao. That being said, there can be probiotics in cacao/cocoa, at least in the raw unroasted forms. Probiotics with demonstrated probiotic properties, such as Lactobacillus fermentum and plantarum strains, have been commonly isolated from fermentations of raw cacao seeds. Therefore, consuming raw cacao nibs, beans or powder could be sources of probiotics. Even some roasted beans could have Bacillus species on them or be contaminated by known pathogens. That is why raw materials and finished chocolate products are routinely tested for the presence of undesirable microbes. Fermentation of cacao reduces some of the polyphenols in it, so a mixture of fermented and unfermented cacao may be a better balance. Unless external, stabilized probiotics are added to it, however, processed cocoa products like candy bars will probably not have any viable probiotic-like microbes in it. Interestingly, microencapsulating some probiotics in chocolate has been shown to increase the viability of the probiotics. How would you like chocolate-covered probiotics?!? Some of the probiotics in raw cacao/cocoa, as mentioned previously, were Lactobacillus fermentum and Lactobacillus plantarum strains. When ten of these strains were used in a rat model of colitis, the number of leukocytes, monocytes and neutrophils (immune cells) were significantly reduced, IFN-g (inflammatory marker) was reduced and IL-10 and IgA significantly increased in the treated group compared to controls. The LAB strains reduced the inflammatory filtrate and restored tissue integrity thereby showing reduction of colitis. Supernatants from strains TCUESC01 and 02 isolated from fermented cocoa were found to inhibit Staphylococcus aureus growth in vitro, and strain 01 reduced the biofilm thickness of S. aureus. 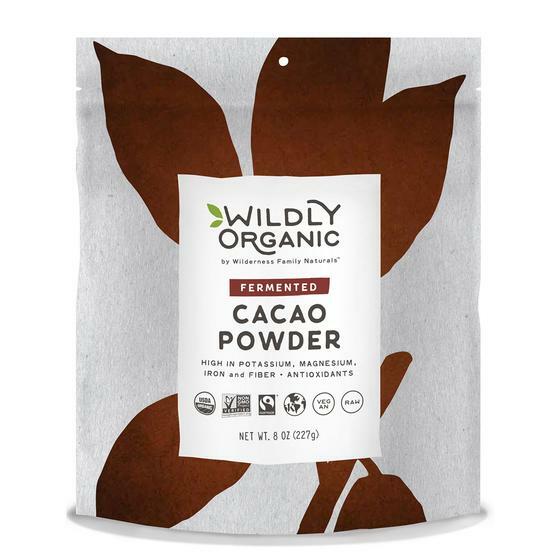 Wildly Organic products from Wilderness Family Naturals are the ones I use for cacao products. They carry organic, Fair-Trade Certified, raw fermented cacao powder organic and organic raw fermented cacao nibs. Both products are easily added to protein shakes, hot cereals, trail mixes, etc. I use stevia leaves to balance out any bitterness from the cacao and all of the greens I use in my shakes. 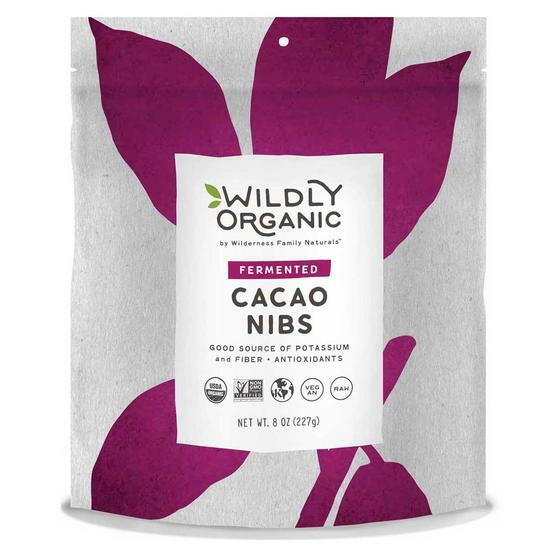 Wilderness Family Naturals also has non-fermented raw cacao powder and nibs, low-sugar hot chocolate mix, sprouting supplies, coconut oil products, a wide selection of raw soaked and dried nuts and seeds (what a timesaver! ), low-carb gluten-free flours and other wonderful products. At the time of this writing, new customers get free shipping! When you look for probiotics in chocolate, many of the products are high-sugar and not organic or fair-trade, but there may be a gem in there for you. Check out these resources for probiotics in chocolate, particularly the Vitacost link. What if You Do Not Like Dark Chocolate? Remember that the more processed cacao/cocoa, the less flavanols and probiotics will be in it naturally. If you are not a fan of anything in the dark lineage, then finding probiotics in it, along with the other health-promoting substances, may not be an option for you. There is no need to punish yourself with having it, as many other foods and drinks, such as blackberries, cherries, grapes, green tea, and apples, to name a few, have flavanols. There also are many foods with gut-friendly fiber, and hundreds of raw and fermented foods and drinks around the world. If you eat a varied diet high in vegetables and fruits and cultures and fermentations, then you probably are getting a lot of flavanols, fiber and helpful microbes. You need a variety of sources of real foods anyway to benefit from a multitude of nutrients and should not rely on cacaoa/cocoa products to fulfill your quota, especially with the potential for heavy metal accumulation. Return to food sources of probiotics.